When three of the five members of Tigers Jaw announced last March that they’d be leaving the band it raised a few doubts amongst fans about where the band would go from there and what the future would hold. That future is now, with Charmer, a record which features all five members and was recorded with the knowledge that five would soon become two. I love the band, and I wanted to love Charmer, but for all of its, well, charm there seems to be something missing here even though the line-up hadn’t changed at the time of recording. It’s a weary Casanova, which for all of its good intentions often comes across as lacklustre and uninspired, a long way away from 2010’s emphatic Two Worlds. Charmer sounds like it was recorded by a band who weren’t 100% there at the time, and maybe it’s just me, but after several listens I still can’t shake it, and that presents an issue. I’ve listened to a lot of emo over the last year, and have written favourably about a fair amount of it, but Charmer didn’t grab me in the way that Tigers Jaw have been capable of doing in the past. It seems to lack bite (sorry), and although the band have used slow songs to their benefit in the past I found the softer songs on their fourth LP to be quite dull and, to use a term I hate, ‘boring’. The Scranton band opt for a much more relaxed approach this time around, and the records feet are planted much more firmly at the emo / indie rock end of the spectrum as opposed to the punk of past releases. Charmer is a far more mature record and far less of an adventurous one as a result – as should perhaps be expected after a four year gap. Tigers Jaw have grown up musically, but lyrically they’re still very much in the mind-set that often makes releases of this nature so relatable, and lines line ‘We’ve become a time capsule buried in the way you make me numb’ sit very well over calmer instrumentation, and there’s less shouting and an increase in subdued musings courtesy of vocalists Ben Walsh and Adam Mcilwee. Brianna Collins, when she does feature, is angelic, providing a gorgeous singsong accompaniment, and the dual vocals she shares on Hum as the lines ‘I’m always talking in circles / I always think ‘til I can’t sleep / You are the leaves at my feet / You are the hum of electric heat’ ring out help to make this one of the standout tracks, and it’s a shame she doesn’t play a bigger part vocally, providing some interesting keys on Frame You most notably instrumentally. In contrast a lot of the time Walsh and Mcilwee sound as if they’re forcing themselves to go on, and although that could be interpreted as the genres trademark uninspired delivery their disinterest sounds very genuine. I Envy Your Apathy features neither of them, and I’m unsure of who’s singing (Pat?) but their poor vocals sit alongside brooding instrumentation which falls flat, making for the records most unconvincing track, not really making a mark at all. 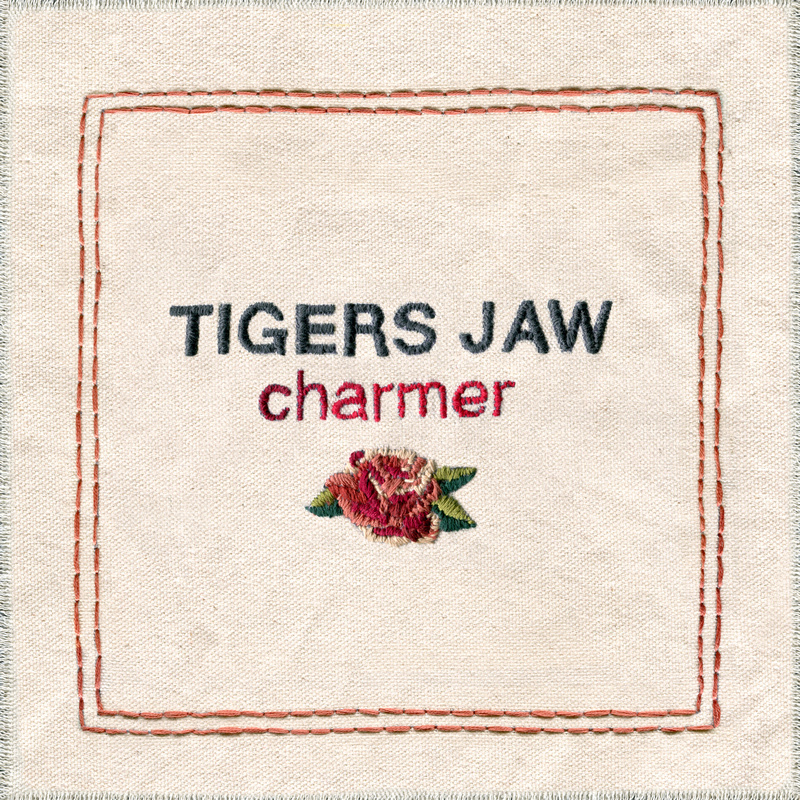 Tigers Jaw are good at what they do, there’s no doubt about that, but you often get the impression when listening to Charmer that they aren’t doing enough. It doesn’t help that they’re so content to sit back almost let songs play themselves out. Emo / indie-rock is often meant to drift, coasting from the opening to closing second, but on Charmer the songs feel longer than they initially seem, which doesn’t play in their favour. Seventh track Slow Divide feels more like the tenth, matching its title as it meanders in and out, redeemed slightly by some great contrasting vocals, whilst Softspoken sounds almost clumsy as it sets downcast vocals against clever instrumentation which doesn’t really match. Maybe I’ve not been listening to it loud enough but Charmer sounds tired and offset in a way which is far less engaging than the genre normally is. For me anyway, the band seem to loosely have lost their touch, but thankfully their fourth LP is saved slightly by the few tracks that manage to really capture the band at their best, a height they don’t hit enough here. The aforementioned Hum is delightful and breezy, calming in nature despite its themes of lost love – comforting almost (‘I kept myself away but I’m starting to like the pain’). The same can be said about ninth track Teen Rocket, which is a shining example of just how much Tigers Jaw are capable of when they hit their stride, being one of the best tracks they’ve ever released. It begins with traditional guitar melodies and gently unravels, adding layers and making use of some of the records most emotional lyrics and a Jesse Lacey-esque delivery in the final minute, which is particularly good. Charmer ends with another highlight in What Would You Do?, a song that comes in at just under six minutes, again beginning delicate with throbbing bass guitars and building from there, bringing instruments in one at a time similar to a lot of the tracks that precede it. What sets the closer apart though is how comfortable in its own sorrow it sounds; where the other songs seemed to slack off What Would You Do? sounds confident, yet not too keen to develop and expand as Mcilwee drawls and Collins flickers into the picture as instrumentation glides. It’s a sombre end to a relatively sombre record as Mcilwee asks ‘What would you do?’ over and over before the song fades, capping off a bittersweet record in most regards. Although I found Charmer to be lacking I’ll still eagerly look forward to whatever comes next, because there’s no doubt that this is a band capable of writing brilliant music, and likely will do with remaining members Briana and Ben, along with whoever else they recruit – if they do. Hopefully that wait won’t last another four years, because I’m not entirely sure that Charmer was worth it. Although it sees the departed members leave on a high it sounds like a stopgap of sorts, closing out the old and making way for the new, at least to me. Chances are you might feel differently, and if you’d like to purchase the record it’s out now digitally (credit to the band and their label Run For Cover Records for releasing it early due to a leak) and available physically as of June 3rd. Listen to: Hum / Teen Rocket / What Would You Do?